Every Photo Contest has by default automated emails activated which will sent immediately to your contest entrants. You can edit those emails and have full control over what they should say. Let me show you how to edit and customize those automated emails. 2. Once clicked several options will appear. 5.1. The first automated email that you can customize and edit is the email that is sent to voters to verify their email. Please note that this email will only be triggered to voters if you have the feature “Email Verification” enabled. In order to edit the content of this email please click anywhere on the blue text. A text editor will appear which will allow you to add any content you wish. 5.2 The next automated email you can customize is the email that is triggered when you have the “Moderation” feature activated. Every time someone enters in your Photo Contest you will have to either approve or disapprove of the entry. You can now click on the “Submission Disapproved” tab to edit the content of this message. To change the email please click anywhere on the blue text. You can even use merge tags to make your email more personalized. You will be provided with a list of all available merge tags which can be copied and pasted into your Subject Line or Email Body so it will automatically populate that information for you when visitors enter in your Photo Contest and receive the automated emails in their inbox. 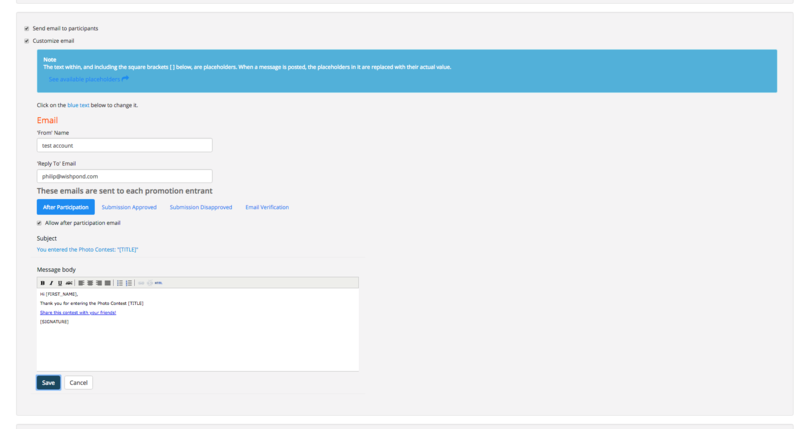 Please note that our system can only generate placeholders that you actually end up using in your form. For example, if you would like to use Last Name as a merge tag and address an entrant by his last name but your form does not have a Last Name Form Field it won’t generate any information.